Almost four years ago – it never seems so long – I read and enjoyed Marcel Aymé’s novel Beautiful Image, brought to us by the reliably interesting Pushkin Press (with their reliably handsome ‘jewel’ edition paperbacks). Pushkin is, as they say on shop windows, under new management, though presumably this title was in the works long before that. The new owners of Pushkin have stated their desire to expand its interests beyond Europe; a welcome ambition, if they can also keep us fed with curious and entertaining volumes like this. Curiously, ‘The Man Who Walked Through Walls’ is not one of the strongest stories here, though its high concept and punchy plot make it an obvious opener. The man is Dutilleul, a clerk who discovers this strange power in his early forties. Refreshingly, he immediately decides to use his ability for malicious ends, first by revenging himself on a hated boss, and then by embarking on a life of crime. Aymé’s clear-eyed insistence on seeing the worst in people is as welcome as it was in Beautiful Image (where a man found his face completely altered, and soon set about seducing his wife). The premise of the story may be capable of being summarised on the back of a tweet, and the ending may be a bit of a trick, but the meat is less in the opportunity than in what Dutilleul (and Aymé) does with it – rather as John Wyndham’s novels are not so much about the speculations (walking plants, creatures from the sea) as about the human response. The longest, and perhaps strongest, story in the book comes next: ‘Sabine Women’, which has a similarly snappy conceit. On the Rue de l’Abreuvoir in Montmartre there lived a young woman named Sabine who had the gift of ubiquity. She could, at will, multiply herself and exist simultaneously, in both body and mind, in as many places as she pleased. Bingo! And so Aymé fires off in another direction. He doesn’t care about plausibility – well, obviously he doesn’t, but what I mean is that he doesn’t bother to seek internal logic or to work out a background. It’s just there, and that’s that. This can cause head-scratching, as when we wonder about the solipsism of the character: we are told that her bodies are “animated by one soul”, but the seat of consciousness seems to shift depending on where it is handiest for narrative purposes. Again, here Aymé’s protagonist doesn’t waste time in spreading herself out to do good works. She takes up with a young painter named Theorem, and indulges herself with him while simultaneously appearing to be a dutiful wife. Her husband notices the change. “If you could only see her, when we stay up of an evening, in the dining room – one would think she were speaking with the angels.” (Aymé adds, mischievously, “For four months, Sabine continued to speak with the angels.”) While her husband is oblivious, Theorem, who knows her secret, becomes wild with jealousy at the notion that she might be multiplying herself elsewhere. He is right to worry: within three months, the “insatiable seductress … had spread nine hundred and fifty copies of herself around the world.” And that’s not the half of it. 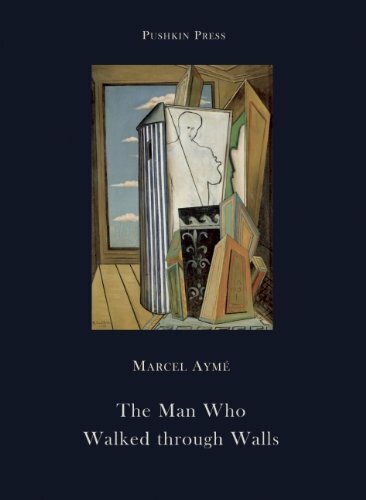 Aymé takes his idea and runs with it merrily, far beyond reason, until the reader is pulled up short by a terrible act (hinted at in the title). Like Dennis Potter’s Brimstone and Treacle, it seems to explore the idea of goodness coming from bad deeds. By the time we have two more stories in this vein – one where a government struggling with overpopulation decides to limit citizens’ living hours per month, and one where countries exist in two time zones at once – it seems as though Aymé is a simple high-concept artist, ploughing a furrow of weird tales as a successor to Théophile Gautier. But the remaining stories in the book concentrate on the characters, and speculative qualities are secondary (there are two scenes of entry to heaven after death) or absent altogether. We have wildly varied stories then, from ‘The Proverb’, where a strict father’s softening toward his son turns out to be the worst horror of all, to ‘Poldevian Legend’, where a devout and observant woman is forced into ironic humiliation by her own piety. Most surprising, and refreshing, however, is ‘The Bailiff’, a neat tale where the most prominent feature is Aymé’s wit. The lead character is sent back from the pearly gates after death to do better deeds and avoid eternal damnation. This he does by spreading his wealth and recording his philanthropy in a book. “I spontaneously increased my maid Mélanie’s salary by fifty francs a month, although she’s a slattern.” It shows pleasing variety in Aymé’s skills, so that even if the shorter length of these pieces means they can’t match Beautiful Image for intensity and force, the range of ideas and imagination on display make it a literary delight worth more than a moment of your time. Curses to you, Self. Another one for the must-read pile. It sounds entertaining, and certainly worth translating, but not perhaps a major work. Given my near-endless TBR pile I think that keeps it off the buy list for the time being. Isn’t it tagged as children literature or young adult? Anyway, it’s interesting to read a review of this book by someone who discovered it with adult eyes. Thanks for introducing me to this author, John. I find it interesting that these stories imagining super-powers for ordinary people or exploring a restrictive government were all written during the occupation of France by the Nazis – coincidence? Perhaps best read together with Alphonse Allais + Raymond Queneau – both translated into English. Might also be interesting to compare/contrast with the fictional work of Brian O’Nolan (writing as Flann O’Brien). Emma’s comment’s interesting, as I seem to recall Le Passe-Muraille figuring in a Penguin collection of French short stories for ‘A’ Level candidates, er, many years ago. This form of French surrealism is certainly best tackled when young – or at least very open to different, however seemingly-crazed, approaches to fiction. Hard to feel critical of a character who gets revenge on an evil boss….